Custom Imprinted Light Up LED Pumpkin Sunglasses are coming with 3 replaceable AG13 batteries and thus they are ready to use straight away. The pumpkin shape allows you to bring a festive look to any night time event easily. These custom party sunglasses consists of 10 cool LED lights and are CPSIA compliant. LED function such as slow flashing, steady and quick flashing makes these custom printed sunglasses very interesting. Order now to get free online proofs and free artwork design services. 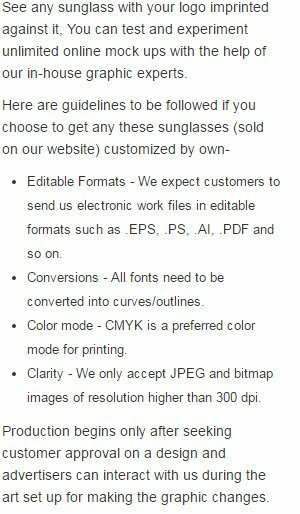 Request a quote to know the value savings that you can avail on bulk orders of Custom Imprinted Light Up LED Pumpkin Sunglasses. Additional Information: Three LED functions: quick flash, slow flash and steady, Includes 3 replaceable AG13 Batteries.